Numbers used for specific purposes in RS274/NGC are often restricted to some finite set of values or some to some range of values. In many uses, decimal numbers must be close to integers; this includes the values of indices (for parameters and carousel slot numbers, for example), M codes, and G codes multiplied by ten. A decimal number which is intended to represent an integer is considered close enough if it is within 0.0001 of an integer value. Uninitialized global parameters, and unused subroutine parameters return the value zero when used in an expression. Uninitialized named parameters signal an error when used in an expression. 31-5000 - G code user parameters. These parameters are global in the G code file, and available for general use. Volatile. 5061-5069 - Coordinates of a G38 probe result (X, Y, Z, A, B, C, U, V & W). Coordinates are in the coordinate system in which the G38 took place. Volatile. 5070 - G38 probe result: 1 if success, 0 if probe failed to close. Used with G38.3 and G38.5. Volatile. 5161-5169 - "G28" Home for X, Y, Z, A, B, C, U, V & W. Persistent. 5181-5189 - "G30" Home for X, Y, Z, A, B, C, U, V & W. Persistent. 5211-5219 - "G92" offset for X, Y, Z, A, B, C, U, V & W. Persistent. 5210 - 1 if "G92" offset is currently applied, 0 otherwise. Persistent. 5211-5219 - G92 offset (X Y Z A B C U V W). 5220 - Coordinate System number 1 - 9 for G54 - G59.3. Persistent. 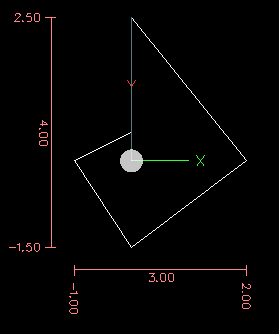 5221-5230 - Coordinate System 1, G54 for X, Y, Z, A, B, C, U, V, W & R. R denotes the XY rotation angle around the Z axis. Persistent. 5241-5250 - Coordinate System 2, G55 for X, Y, Z, A, B, C, U, V, W & R. Persistent. 5261-5270 - Coordinate System 3, G56 for X, Y, Z, A, B, C, U, V, W & R. Persistent. 5281-5290 - Coordinate System 4, G57 for X, Y, Z, A, B, C, U, V, W & R. Persistent. 5301-5310 - Coordinate System 5, G58 for X, Y, Z, A, B, C, U, V, W & R. Persistent. 5321-5330 - Coordinate System 6, G59 for X, Y, Z, A, B, C, U, V, W & R. Persistent. 5341-5350 - Coordinate System 7, G59.1 for X, Y, Z, A, B, C, U, V, W & R. Persistent. 5361-5370 - Coordinate System 8, G59.2 for X, Y, Z, A, B, C, U, V, W & R. Persistent. 5381-5390 - Coordinate System 9, G59.3 for X, Y, Z, A, B, C, U, V, W & R. Persistent. 5399 - Result of M66 - Check or wait for input. Volatile. 5400 - Tool Number. Volatile. 5401-5409 - Tool Offsets for X, Y, Z, A, B, C, U, V & W. Volatile. 5410 - Tool Diameter. Volatile. 5411 - Tool Front Angle. Volatile. 5412 - Tool Back Angle. Volatile. 5413 - Tool Orientation. Volatile. 5420-5428 - Current relative position in the active coordinate system including all offsets and in the current program units for X, Y, Z, A, B, C, U, V & W, volatile. 5599 - Flag for controlling the output of (DEBUG,) statements. 1=output, 0=no output; default=1. Volatile. 5600 - Toolchanger fault indicator. Used with the iocontrol-v2 component. 1: toolchanger faulted, 0: normal. Volatile. 5601 - Toolchanger fault code. Used with the iocontrol-v2 component. Reflects the value of the toolchanger-reason HAL pin if a fault occurred. Volatile. 1-30 Subroutine local parameters of call arguments. These parameters are local to the subroutine. Volatile. See also the chapter on O-Codes. #<named parameter> is a local named parameter. By default, a named parameter is local to the scope in which it is assigned. You can’t access a local parameter outside of its subroutine. This means that two subroutines can use the same parameter names without fear of one subroutine overwriting the values in another. #<_global named parameter> is a global named parameter. They are accessible from within called subroutines and may set values within subroutines that are accessible to the caller. As far as scope is concerned, they act just like regular numeric parameters. They are not stored in files. It is an error to use a non-existent named parameter within an expression, or at the right-hand side of an assignment. Printing the value of a non-existent named parameter with a DEBUG statement - like (DEBUG, <no_such_parameter>) will display the string #. 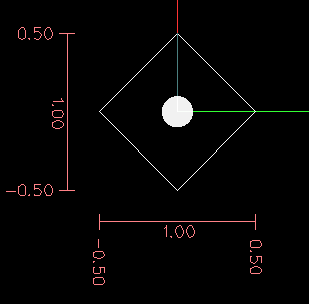 #<_coord_system> - Return a float of the current coordinate system name(G54..G59.3). For example if your in G55 coordinate system the return value is 550.000000 and if your in G59.1 the return value is 591.000000. #<_feed> - Return the current value of F, not the actual feed rate. #<_rpm> - Return the current value of S, not the actual spindle speed. #<_x> - Return current relative X coordinate including all offsets. Same as #5420. #<_y> - Return current relative Y coordinate including all offsets. Same as #5421. #<_z> - Return current relative Z coordinate including all offsets. Same as #5422. #<_a> - Return current relative A coordinate including all offsets. Same as #5423. #<_b> - Return current relative B coordinate including all offsets. Same as #5424. #<_c> - Return current relative C coordinate including all offsets. Same as #5425. #<_u> - Return current relative U coordinate including all offsets. Same as #5426. #<_v> - Return current relative V coordinate including all offsets. Same as #5427. #<_w> - Return current relative W coordinate including all offsets. Same as #5428. #<_task> - 1.0 if the executing interpreter instance is part of milltask, 0.0 otherwise. Sometimes it is necessary to treat this case specially to retain proper preview, for instance when testing the success of a probe (G38.n) by inspecting #5070, which will always fail in the preview interpreter (e.g. Axis). The binary operations are divided into several groups according to their precedence. If operations in different precedence groups are strung together (for example in the expression [2.0 / 3 * 1.5 - 5.5 / 11.0]), operations in a higher group are to be performed before operations in a lower group. If an expression contains more than one operation from the same group (such as the first / and * in the example), the operation on the left is performed first. Thus, the example is equivalent to: [ [ [2.0 / 3] * 1.5] - [5.5 / 11.0] ] , which is equivalent to to [1.0 - 0.5] , which is 0.5. The available functions are shown in following table. Arguments to unary operations which take angle measures (COS, SIN, and TAN ) are in degrees. Values returned by unary operations which return angle measures (ACOS, ASIN, and ATAN) are also in degrees. The FIX function rounds towards the left (less positive or more negative) on a number line, so that FIX[2.8] =2 and FIX[-2.8] = -3. The FUP operation rounds towards the right (more positive or less negative) on a number line; FUP[2.8] = 3 and FUP[-2.8] = -2. Inline comments on O words should not be used see the O Code comments section for more information. (PROBECLOSE) - will close the open probelog file. For more information on probing see the G38 Section. Examples of logging are in nc_files/examples/smartprobe.ngc and in nc_files/ngcgui_lib/rectange_probe.ngc sample G code files. For example: to print a named global variable to stderr (the default console window). Using % to wrap a G code file will not do the same thing as using a program end. The machine will be in what ever state the program left it in using %, the spindle and coolant may still be on and things like G90/91 are left as the last program set them. If you don’t use a proper preamble the next program could start in a dangerous condition. Perform motion (G0 to G3, G33, G38.n, G73, G76, G80 to G89), as modified (possibly) by G53. G17 use XY plane, G20 inch mode, G40 cancel diameter compensation, G49 cancel length offset, G54 use coordinate system 1, G80 cancel canned cycles, G90 absolute distance mode, G94 feed/minute mode.